Looks like we need a new subject category for the demise of the journalism sector. As discussed frequently on this blog, most journalists are little more than press agents for government officials (1, 2, 3). US news outlets typically take the perspective of the Washington insider, repeating solemn pronouncements from their confidential sources as if these were verifiable facts without questioning, challenging, even investigating. It’s a simple bargain: report what the official sources say in exchange for access to those sources, without which you lose status. The citizenry wants us to stay out of this conflict. And there is no legislative majority pushing for intervention. A declaration of war against Syria would almost certainly fail in Congress. Yet the consensus in the press is that President Obama faces tremendous pressure to intervene. . . .
Where is this pressure coming from? Strangely, that question doesn’t even occur to a lot of news organizations. Take this CBS story. The very first sentence says, “The Obama administration faced new pressure Thursday to take action on Syria.” New pressure from whom? The story proceeds as if it doesn’t matter. How can readers judge how much weight the pressure should carry? Pressure from hundreds of thousands of citizens in the streets confers a certain degree of legitimacy. So does pressure from a just-passed House bill urging a certain course of action, or even unanimous pressure from all of the experts on a given subject. What I’d like is if news accounts on pressure to intervene in Syria made it clear that the “growing calls … for forceful action” aren’t coming from the people, or Congressional majorities, or an expert consensus. The pressure is being applied by a tiny, insular elite that mostly lives in Washington, D.C., and isn’t bothered by the idea of committing America to military action that most Americans oppose. Some reporters suffer from what Thomas Sowell called the vision of the anointed, and most live in a bubble surrounded by insiders and elites who share their outlook. But I suspect the main reason for this style of writing is the quid pro quo described above. As some readers may already have heard, David Landes passed away on August 17. The New York Times has not seen fit to publish an obituary, but here is one by Landes’s son Richard. I only met Landes once, at the International Economic History Association meeting in Milan in 1994. I attended a session he chaired on the Industrial Revolution. Rondo Cameron, a real character, sat himself down in the front row near the podium. Cameron was one of the most vocal proponents of the idea that there was actually no such thing as the Industrial Revolution, based largely on the argument that income per capita did not rise dramatically during the late eighteenth and early nineteenth century (even though both the numerator and denominator were rising dramatically). Landes opened the session, and some hapless economic historian began presenting a paper on something or other during the Industrial Revolution. Cameron immediately put up his hand and announced that the presenter’s premise was mistaken – because there had been no Industrial Revolution! Landes then sprang back to the podium and delivered a wonderful extemporaneous speech on why it was indeed appropriate to talk about an Industrial Revolution, including an analysis of the word “revolution” and its first use in French. This session also sticks in memory because half-way through an audience member suffered and epileptic fit and had to be carted out to an ambulance. I must say that, in the great debates in which Landes engaged, I most often found myself coming down on his side. Further to my previous post on misplaced confidence, here is Robert Pindyck on one of the critical tools used by climate scientists. Climate Change Policy: What Do the Models Tell Us? Very little. A plethora of integrated assessment models (IAMs) have been constructed and used to estimate the social cost of carbon (SCC) and evaluate alternative abatement policies. These models have crucial flaws that make them close to useless as tools for policy analysis: certain inputs (e.g. the discount rate) are arbitrary, but have huge effects on the SCC estimates the models produce; the models’ descriptions of the impact of climate change are completely ad hoc, with no theoretical or empirical foundation; and the models can tell us nothing about the most important driver of the SCC, the possibility of a catastrophic climate outcome. IAM-based analyses of climate policy create a perception of knowledge and precision, but that perception is illusory and misleading. Thanks to Bob Murphy for the pointer. 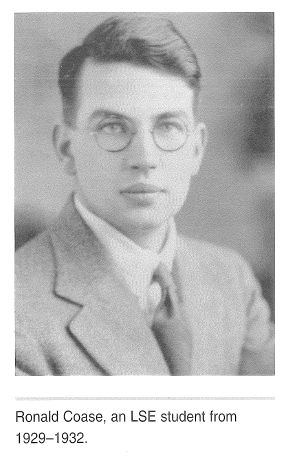 Here’s a picture of Ronald Coase you may not have seen, from his student days at LSE. From Hayek: A Commemorative Album (London: Adam Smith Institute, 1998), and courtesy of Bettina Greaves. Economists and management scholars know Stuart Macaulay’s landmark 1963 article, “Non-Contractual Relations in Business: A Preliminary Study,” as the foundation for modern work in relational contracting. As Williamson (1985, p. 10) put it, “Macaulay’s studies of contractual practices support the view that contractual disputes and ambiguities are more often settled by private ordering than by appeal to the courts — which is in sharp contrast with the neoclassical presumptions of both law and economics.” A new book on Macaulay has promoted a symposium over at the ContractsProf Blog. I’m particularly looking forward to this week’s contributions, especially the one from Gillian Hadfield. Many people who condemn pop culture and dismiss it as artistically worthless dwell on the fact that films and television shows are almost never the products of a single artist working on his own. It is therefore important to show that many of the great works of high culture grew out of a collaborative process too. There is nothing about cooperation in artistic creation that precludes high quality. Too many cooks may spoil the broth, but they may also each add a distinctive flavor and work together to bring the recipe to perfection. The processes of synergy and feedback work in popular culture just the way they do in other areas of human endeavor. This is all part of my defense of popular culture — to demonstrate that the conditions of production in film and television are not necessarily incompatible with artistic as well as commercial success. Likewise, entrepreneurship and innovation are collaborative media — which is easy to see once you realize that entrepreneurship is not about recognizing “opportunities,” but acquiring and controlling resources that are used in production. Post AoM: Are Management Types Too Spoiled? So, this year’s version of the Academy of Management Meetings, the major association of management researchers, took place in Orlando, Fl. The conference theme was “Capitalism in Question,” a theme with decidedly “lefty” connotations (see the official description of the theme here). The politization of the event was discussed in a Business Week blog that was dripping with irony. Yes, Disney World may perhaps clash with the refined and elevated tastes of many a management professor (I didn’t myself particularly fancy those plastic baroque carpes (aka “dolphins”)), but, hey, this is a conference. You are supposed to be at work. To be sure, the Academy of Management is about hand-shaking and meeting friends, and building and maintaining networks are obviously productive input in any academic’s work process. And yet, 99% of the participants had their travel and stay and fee paid for by someone else (in many cases, the taxpayers). The sessions, PDWs, symposia, and so on were no worse than usual. No one presumably had to go hungry to bed. It was certainly possible to get the beers you wanted. The receptions were well-attended, noisy and alcoholic. In short, pretty much business as usual. So, perhaps it is time to cut the whining which fundamentally signals that you think of the AoM meetings as mainly about your own on-the-job consumption. It would have been much better to use energy spent on whining about diminished the consumption potential of Orlando on critique of the conference theme.